Hi everyone, hope you’ve had an awesome last couple weeks! My mom came to visit which was awesome not only because it’s great to hang out with my mom, but we repainted my bathroom. It has transformed from a gross lemon yellow into a delightful warm light-medium brown. HUGE difference. No longer do I look kind of sickly when I look in the mirror. No longer do I cringe every time I walk by. No longer do I stare at the walls wondering why someone would pick that color and why they did such a crap job of painting it. It’s magical. I’d post a picture but my bathroom is pretty small and it’s hard to get a reasonable one. In any case, November has flown by and I can’t believe next week is already December. While pretty soon I’ll be making batches of almond roca and heading back to Alaska for Christmas, right now I’m still in full on fall flavor mode: apple and pumpkin. I’ll be making a pumpkin cheesecake for Thanksgiving but this weekend I was feeling apple-y. I actually came across this recipe a few months ago when it was crazy hot outside, so I filed it away to use at a later date. Fortunately, it comes together very quickly assuming you have all the ingredients on hand which makes it great for making on a whim. These donuts are not overwhelmingly apple flavored but it’s definitely there along with the spices. 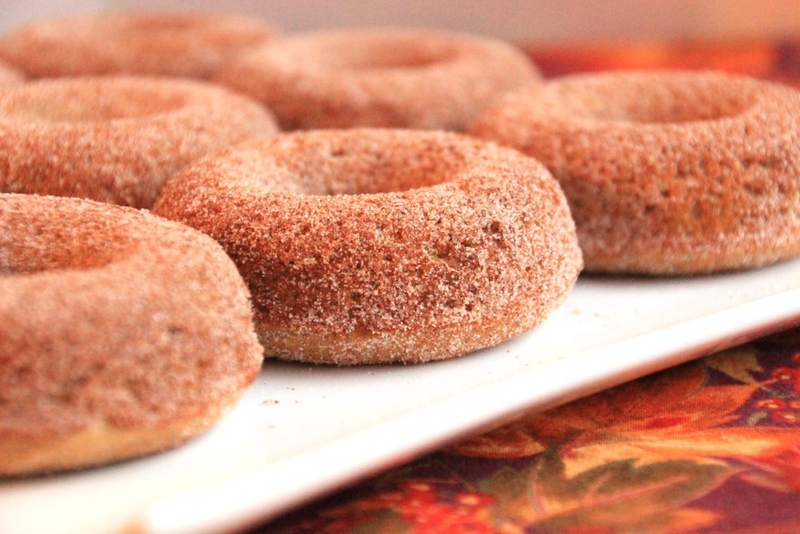 A cinnamon sugar coating pairs nicely for a cozy experience – kick it up a notch by having some hot cider on the side. They are denser than a fried donut, as the bake variety tends to be, but they are definitely lighter than a typical cake. If you don’t have a donut pan, you can bake them in a mini muffin tin as knockoff donut holes. Run that Thanksgiving 5k (or go for a walk, or whatever) then come home and make a batch of these donuts while you’re prepping for dinner. It’ll be a great snack and won’t take up too much precious oven time. Just make sure you have a few people to help you eat them all. Reduce the cider by pouring it into a small saucepan and simmer over medium heat for 15-20 minutes. Measure out 1/2 cup and let it cool in the fridge while you mix the rest of the batter. Preheat oven to 350 degrees Fahrenheit. Butter a donut pan (or two) or spray a mini muffin tin with nonstick spray and set aside. Whisk flour, cinnamon, baking soda, cloves, and salt in a large bowl. Set aside. In a small bowl, whisk together egg and sugars until completely combined. Mixture will be grainy but consistent in color. Whisk in the buttermilk, vanilla, and reduced 1/2 cup of cider. Pour the wet mixture into the dry ingredients and mix gently until just combined. Mixture should still be a bit lumpy – don’t over mix! For donuts: Scoop batter into a large Ziploc bag, snip the tip, and pipe the donut wells 2/3 – 3/4 full. Bake for 10-12 minutes or until a toothpick comes out clean. For donut holes: Fill mini muffin wells 3/4 full and bake for 9-11 minutes or until a toothpick comes out clean. Let donuts cool in the pan for about 5 minutes, then remove to a wire rack. Mix together sugar and ground cinnamon to your preference. One at a time, dip still-warm donuts into the sugar and coat completely. Serve the same day if possible, but store any leftovers in an airtight container on the counter. 1 Put the egg in warm water for a few minutes to quickly bring it to room temperature. You can do the same with buttermilk by pouring it into a sealed container first.